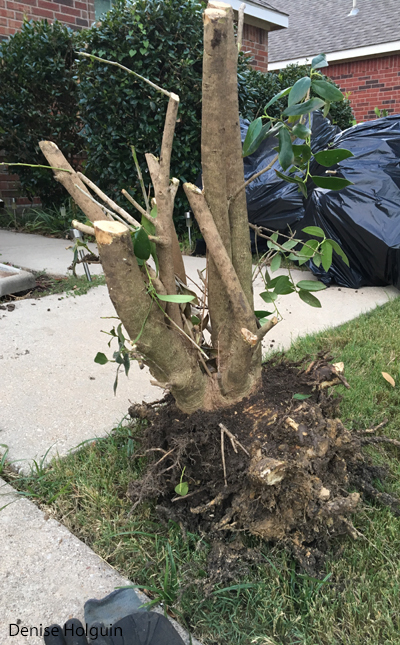 I received a notice from the HOA to trim the holly bushes. I never enjoyed getting reprimanded as a kid and that hasn’t changed as an adult. But I couldn’t disagree with the HOA. The bushes were unruly. I also had a reason for them being unkempt (aside from laziness). Holly bushes have sharp leaves, making them very challenging to trim and clean. I dutifully trimmed the bushes but decided to fix the problem permanently. I will remove them. I removed one bush last year in another area of the yard. It took all day and I thought it would kill me— but I succeeded. What’s another 5 bushes? (It felt like 5 billion). Armed with three garden tools, brute force (ha) and tenacity— I set out to do the impossible. The first step is chopping most of the branches and leaves. Then it’s time for the first strike of the shovel surrounding the bush. It feels futile. I feel foolish. But I remain steadfast. I removed a bush last year. I can do it again. I dig and dig. 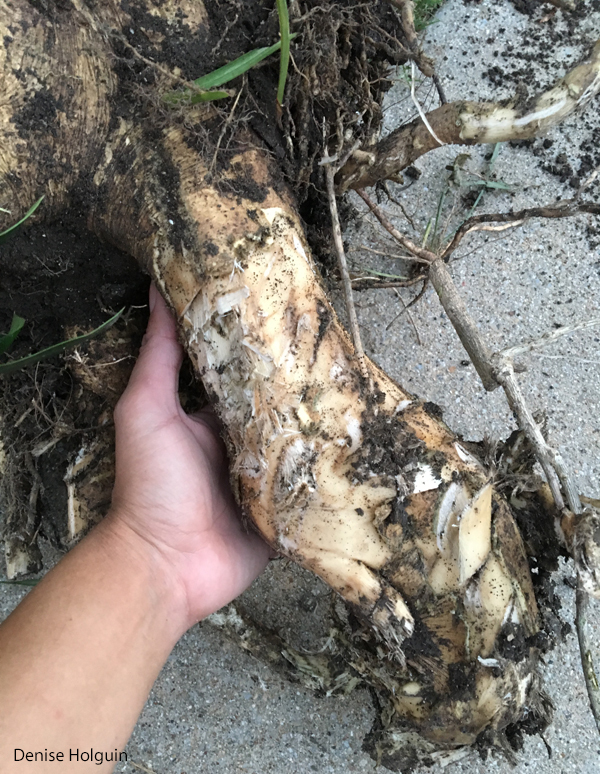 I uncover an unspeakably heinous root system. I dig around the roots to find places where I can chop. I talk to the bush and assure it— I will stay up all night if I have to. I will dig a hole to China if need be. It will be removed. Period. I push on the bush to test how loose it has become. It’s not budging. It might as well be a pole in concrete. My resolve weakens. Maybe I don’t have what it takes. I wish I had a Mack truck to pull this bush out of the ground. This is exhausting work. But I will succeed. I must become the Mack truck. I must become a force of nature. I apply leverage using the shovel. I keep working the area surrounding the bush. And then… the bush gives the slightest hint of surrender. It moves when I push it. That motivates me to keep going. But there’s still a long way to go. More digging. I push. I pull. I recite lines from the Gladiator. I imagine success. The bush finally succumbs to its fate. I haul the remains like a hunting trophy to my driveway. I take a selfie with my dead bush. This is the anti-selfie— representing more than the superficial. I praise God for the grit not to quit. I stumble inside my house out of exhaustion. I’m so worn out, even my fingertips hurt. I repeat the process 4 more times. One bush every weekend. Each bush I remove becomes fuel and solid proof I can and will continue to succeed. The last bush was the hardest— it was the biggest. The roots were massive.. I risked injury as I pushed and pulled and prepared to crash on it or my brick house. Sweat was pouring from my face. The mosquitoes were feasting on me and I didn’t care. I considered giving up or at least trying another day. But I can’t give up. I put my head flashlight on. 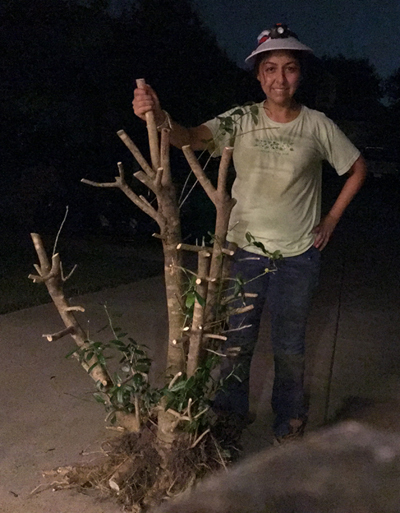 Yes, neighbors, I am that person that removes stubborn bushes at night. The bush gave up after several hours of battle. I left my trophy propped against the house for a couple days. I was proud of my work. I shared the story of my success to my friend Tore. He replied: “let me give you a tip.” I braced myself for an obvious tip I didn’t think of that would have made the job easier. I probably could have done a better job with leverage…. The bushes in the background were awaiting their fate. 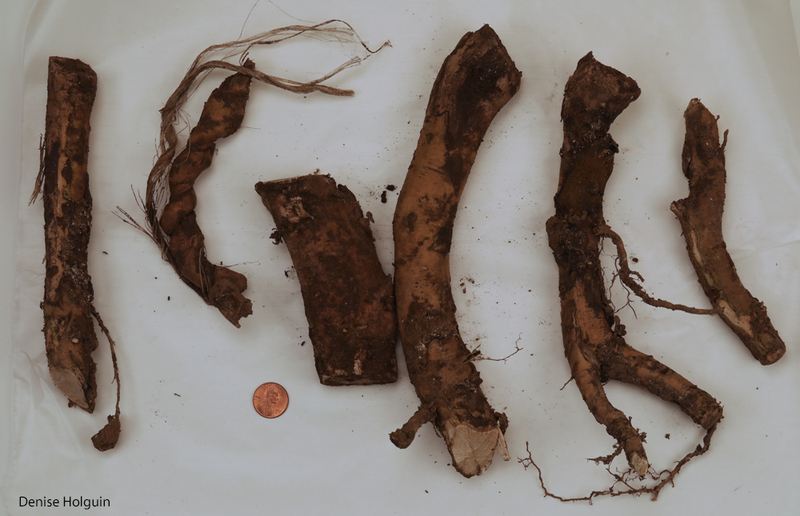 An assortment of the root system cut out of the ground. Notice the second sample has a spiral effect caused by twine that was entangled in the root. 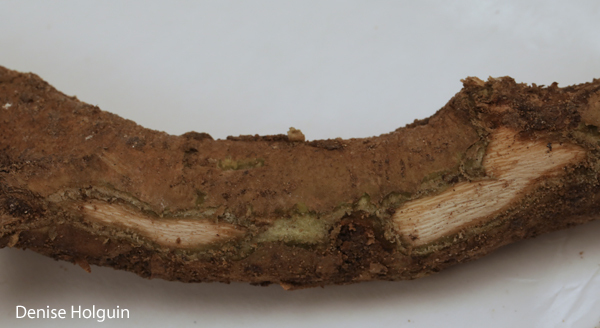 I took a close-up of the last root shown in the group photo. 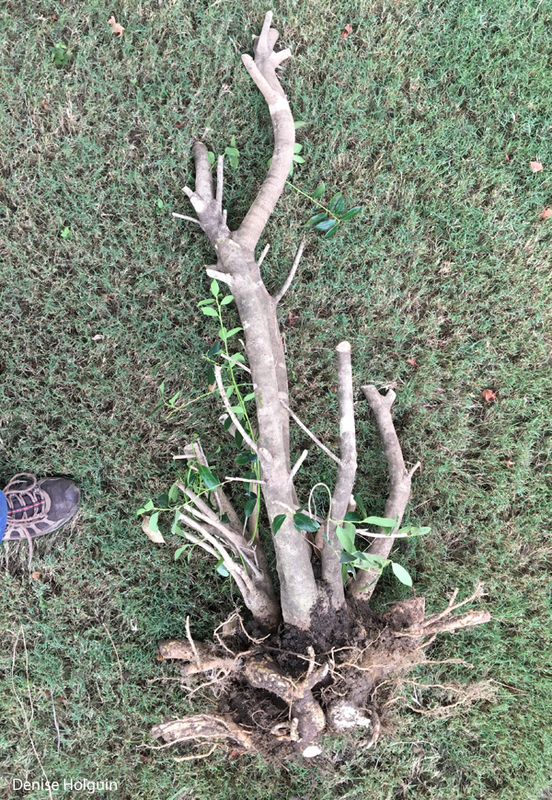 It was dug up several weeks after the bush was removed. It’s still green. An exhausted but victorious Denise shown below. You get an idea of how large these bushes were. * With apologies to anyone who has or likes holly bushes. I will concede they have their uses – but they aren’t the right fit for me. Previous Previous post: The ongoing series on mushrooms!